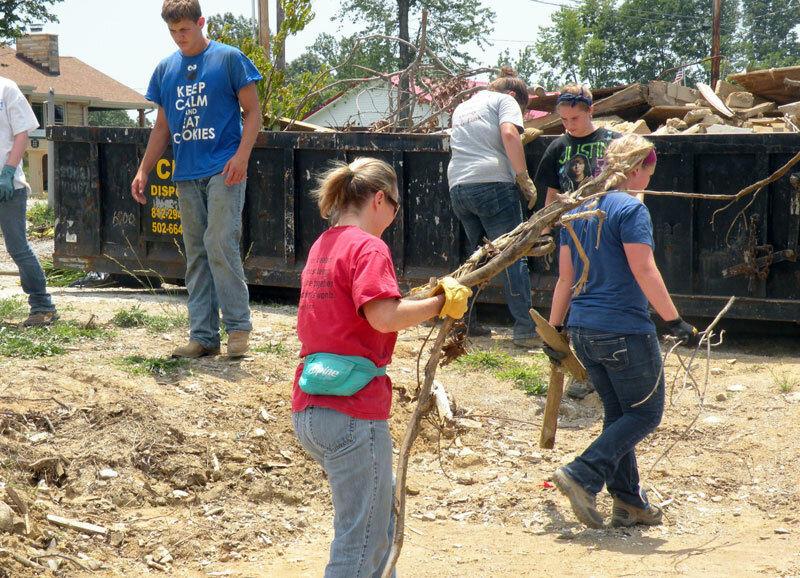 High school students on the archdiocese’s Homeland Mission project on June 24-29 help clear debris left by the tornadoes that devastated the southern Indiana community of Henryville on March 2. (Submitted photo) Click for a larger version. The special moments started to stack up, leading the teenagers back to the challenge that a priest had given them at the beginning of their journey. At 19, Steven Meuleman recalls the older woman who cried when the teenagers helped at her home during the archdiocesan Homeland Mission effort on June 24-29. On one of those scorching summer days, the teenagers lined the side of a hill, forming a “bucket brigade” that passed bucket after bucket of water up the hill to the woman’s home in Henryville, one of the southern Indiana communities that had been devastated by tornadoes on March 2. The water was needed to nourish the tree saplings that had been planted to replace the towering trees near the woman’s home which had been flicked away like toothpicks by the tornadoes. At 14, Matthew Fajt recalls the unexpected reaction he received from Alzheimer’s patients at a New Albany nursing home—and the surprising feeling he experienced, too. The two teenagers were part of a 50-member group from cities and towns across the archdiocese—Bloomington, Greencastle, Greenwood, Indianapolis and Terre Haute—who dedicated a week of their summer vacation to do mission work at home as part of the archdiocesan Homeland Mission effort that focused on southern Indiana this year. The archdiocesan effort followed a week after 40 high school students from the New Albany Deanery also helped in the area devastated by tornadoes. A similar message was shared with the archdiocesan Homeland Mission group during the Mass at Holy Spirit Church in Indianapolis, where their six-day journey began on June 24. Msgr. Paul Koetter, pastor of Holy Spirit Parish, challenged the teenagers to look for God in the situations they would face during their trip. That theme resonated throughout their experiences for the teenagers and adult leaders on the trip. The soup kitchen provided another surprise for Matthew. Matthew’s reaction was common among the teenagers who took part in the Homeland Mission project, says Kay Scoville, archdiocesan director of youth ministry. The teenagers seemed to grow in their faith with each day and each experience, Scoville says. It grew as they helped repair the roof of a house owned by an elderly woman who had no insurance. It grew as they sorted donations at the community center in Henryville. It grew as they focused on their experiences during morning and evening prayers, and daily Mass. That quote was written on the back of T-shirts that the teenagers wore during their week of service. That quote was also imprinted in their hearts. Meuleman saw that same change in many of the teenagers. That message is a promise for the present and the future of the Church, according to Scoville.